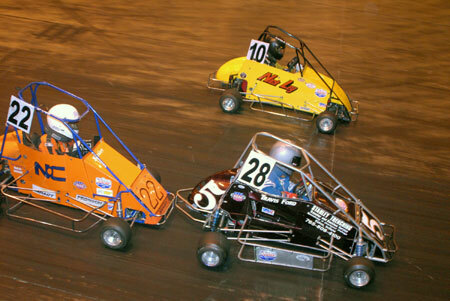 “Rumble in Fort Wayne,” Fort Wayne, Ind. First heat, round one (8 laps) -- Nick Ley, Thomas Prock, Shelby Campbell, Boomer Logan, Cannon Konzer, Michael Gass. Second heat, round two (8 laps) -- Mason Barnes, Travis Ford, John Klavon Jr., David McKinney, Jonathon Lesiecki, Trey Johnson. First heat, round two (8 laps) -- Konzer, Ley, Logan, Prock, Gass, Campbell. Second heat, round two (8 laps) -- Ford, Klavon, Barnes, Lesiecki, Johnson. Feature (20 laps) -- 1. Nick Ley; 2. Cannon Konzer; 3. Thomas Prock; 4. John Klavon Jr.; 5. Shelby Campbell; 6. Michael Gass; 7. Jonathon Lesiecki; 8. Travis Ford; 9. Trey Johnson; 10. David McKinney; 11. Mason Barnes; 12. Boomer Logan. First heat, round one (8 laps) -- Mox Price, Ross Rankine, Cason Konzer, Scott Goffin, Dakota Busche, Cooper Clouse, Kyle Feeney. Second heat, round one (8 laps) -- Austin Nemire, Richie Streicher, Riley Feeney, Zachary Tribble, Austin Prock. First heat, round two (8 laps) -- Rankine, Clouse, Price, Konzer, Goffin, K. Feeney, Busche. Second heat, round two (8 laps) -- Prock, Streicher, Nemire, R. Feeney, Tribble. Feature (20 laps) -- 1. .Cooper Clouse; 2. Cason Konzer; 3. Ross Rankine; 4. Austin Prock; 5. Mox Price; 6. Austin Nemire; 7. Riley Feeney; 8. Richie Streicher; 9. Kyle Feeney; 10. Scott Goffin; 11. Dakota Busche; 12. Zachary Tribble. First heat, round one (8 laps) -- Thomas Prock, Nick Ley, Kyra Yard, Drew Warner, Trey Johnson, David McKinney. Second heat, round one (8 laps) -- Shelby Campbell, Michael Gass, Travis Ford, Jonathon Lesiecki, Mason Barnes, Arica Fleenor. First heat, round two (8 laps) -- Johnson, Prock, Ley, Warner, McKinney. Second heat, round two (8 laps) -- Ford, Campbell, Gass, Barnes, Lesiecki, Fleenor. Feature (20 laps) -- 1. Shelby Campbell; 2. Trey Johnson; 3. Nick Ley; 4. Thomas Prock; 5. Travis Ford; 6. Drew Warner; 7. Michael Gass; 8. David McKinney; 9. Jonathon Lesiecki; 10. Arica Fleenor; 11. Kyra Yard; 12. Mason Barnes. First heat, round one (8 laps) -- Ross Rankine, Austin Nemire, Scott Goffin, Myles Chandler, Brittany Starke, Isaac Chapple. Second heat, round two (8 laps) -- Cason Konzer, Cooper Clouse, Austin Prock, Parker Smith, Dakota Busche. First heat, round two (8 laps) -- Rankine, Nemire, Goffin, Chapple, Starke, Chandler. Second heat, round two (8 laps) -- Konzer, Clouse, Prock, Smith, Busche. Feature (20 laps) -- 1. .Cason Konzer; 2. Ross Rankine; 3. Cooper Clouse; 4. Austin Nemire; 5. Dakota Busche; 6. Scott Goffin; 7. Austin Prock; 8. Brittany Starke; 9. Isaac Chapple; 10. Parker Smith; 11. Myles Chandler. Heat, round one (8 laps) -- Mox Price, Starla Parsons, Hayden Dickerson, Garrett Johnson, Ashton Thompson, Tyler Garner, Baden Stewart, Kaden Atkins, Evan Sheldon, Louis McGrath. Heat, round two (8 laps) -- Price, Garner, Dickerson, Parsons, Atkins, Sheldon, Thompson, McGrath, Stewart. Feature (20 laps) -- 1. Mox Price; 2. Hayden Dickerson; 3. Garrett Johnson; 4. Ashton Thompson; 5. Kaden Atkins; 6. Evan Sheldon; 7. Tyler Garner; 8. Louis McGrath; 9. Baden Stewart; 10. Starla Parsons. First heat, round one (8 laps) -- Nick Ley, Cannon Konzer, Boomer Logan, Shelby Campbell, Thomas Prock, Trey Johnson, John Klavon Jr.
Second heat, round two (8 laps) -- Michael Gass, Travis Ford, Jonathon Lesiecki, Mason Barnes. First heat, round two (8 laps) -- Ley, Konzer, Campbell, Johnson, Logan, Prock, Klavon. Second heat, round two (8 laps) -- Gass, Ford, Lesiecki, Barnes, McKinney. Feature (20 laps) -- 1. Cannon Konzer; 2. Nick Ley; 3. Shelby Campbell; 4. John Klavon Jr.; 5. Boomer Logan; 6. Travis Ford; 7. Trey Johnson; 8. Michael Gass; 9. Jonathon Lesiecki; 10. David McKinney. First heat, round one (8 laps) -- Kyle Feeney, Richie Streicher, Austin Nemire, Dakota Busche, Zachary Tribble, Scott Goffin. Second heat, round one (8 laps) -- Cooper Clouse, Cason Konzer, Austin Prock, Ross Rankine, Mox Price, Riley Feeney. First heat, round two (8 laps) -- K. Feeney, Streicher, Busche, Nemire, Tribble. Second heat, round two (8 laps) -- Prock, Rankine, R. Feeney, Konzer, Price, Clouse. Feature (20 laps) -- 1. Austin Prock; 2. Austin Nemire; 3. Cason Konzer; 4. Kyle Feeney; 5. Richie Streicher; 6. Cooper Clouse; 7. Riley Feeney; 8. Ross Rankine; 9. Scott Goffin; 10. Mox Price; 11. Dakota Busche. First heat, round one (8 laps) -- Nick Ley, Drew Warner, Shelby Campbell, Christopher Russell, Travis Ford, Mason Barnes. Second heat, round one (8 laps) -- Michael Gass, Thomas Prock, Kyra Yard, Jonathon Lesiecki, Arica Fleenor, David McKinney. First heat, round two (8 laps) -- Campbell, Russell, Ley, Barnes, Ford, Warner. Second heat, round two (8 laps) -- Gass, Prock, Yard, Lesiecki, McKinney, Fleenor. Feature (20 laps) -- 1. Nick Ley; 2. Shelby Campbell; 3. Kyra Yard; 4. Mason Barnes; 5. Trey Johnson; 6. Thomas Prock; 7. Travis Ford; 8. Jonathon Lesiecki; 9. Drew Warner; 10. David McKinney; 11. Arica Fleenor. First heat, round one (8 laps) -- Ross Rankine, Cason Konzer, Austin Prock, Brittany Starke, Dakota Busche, Myles Chandler. Second heat, round two (8 laps) -- Cooper Clouse, Austin Nemire, Isaac Chapple, Scott Goffin. First heat, round two (8 laps) -- Prock, Rankine, Konzer, Busche, Starke, Chandler. Second heat, round two (8 laps) -- Nemire, Clouse, Chapple, Goffin. Feature (20 laps) -- 1. Cooper Clouse; 2. Austin Prock; 3. Cason Konzer; 4. Ross Rankine; 5. Parker Smith; 6. Austin Nemire; 7. Myles Chandler; 8. Dakota Busche; 9. Isaac Chapple; 10. Scott Goffin; 11. Brittany Starke. First heat, round one (8 laps) -- Mox Price, Starla Parsons, Jackson Slone, Hayden Dickerson, Louis McGrath, Kaden Atkins, Jace Gochenour. Second heat, round one (8 laps) -- Ashton Thompson, Tyler Garner, Garrett Johnson, Evan Sheldon, Baden Stewart, Dudan Danford. First heat, round two (8 laps) -- Price, Dickerson, Slone, Atkins, McGrath, Parsons, Gochenour. Second heat, round two (8 laps) -- Garner, Stewart, Johnson, Thompson, Danford, Sheldon. Feature (20 laps) -- 1. Mox Price; 2. Tyler Garner; 3. Garrett Johnson; 4. Starla Parsons; 5. Hayden Dickerson; 6. Jackson Slone; 7. Louis McGrath; 8. Ashton Thompson; 9. Kaden Atkins; 10. Baden Stewart; 11. Dugan Danford.